The chefs at Cantina 1910, in its first season at 5025 North Clark, are commemorating Day of the Dead. The holiday is celebrated throughout Mexico, and is an occasion for families to remember those who have passed, traditionally by decorating their graves with altars, and bringing marigolds, sugar skulls, breads, and their favorite foods. Cantina 1910 has created some desserts and cocktails in the spirit of the day, in homage to those who have crossed to the other side of the veil. Churro of the Dead -- Peanut Butter Mousse, Salted Caramel, Dark Chocolate. 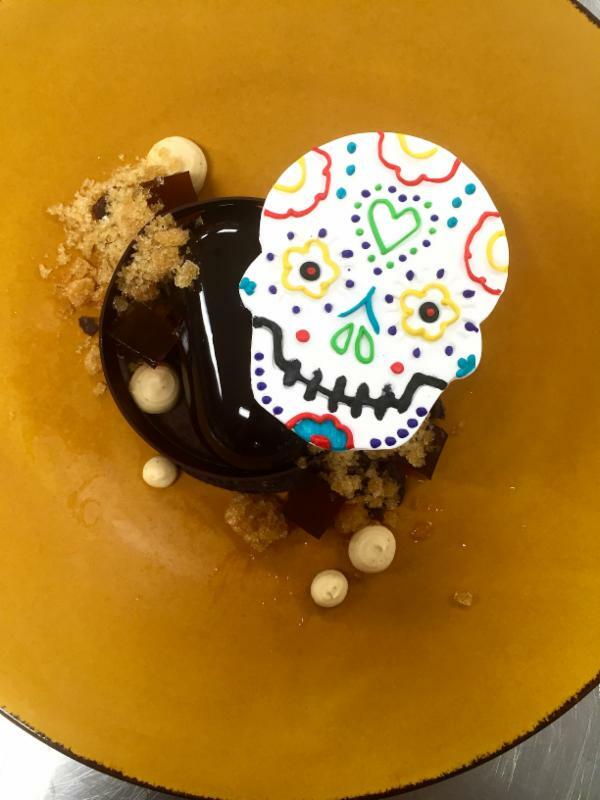 The first of Pastry Chef Andrew Pingul's desserts made special for Halloween and Dia De Los Muertos is his take on a Snickers, which was his late Grandfather's favorite candy bar. He passed away fifteen years ago this Halloween. Don Carlos -- Chocolate Mousse, Coffee, Vanilla Crema (pictured). Named in honor of the late Carlos Hernandez, owner of Don Carlos Bar and Banquet Hall and father figure to our General Manager, John Saint-Jon, this creamy, chocolaty dessert features house-made chocolate mousse, Counter Culture coffee and vanilla crema. Complemented with our take on the traditional Mexican sugar skull. Apple Spice Cocktail -- 'Falling Leaves'. Sip on this mixture of whiskey, Vandermill Cider, St. Elizabeth allspice and bitters, warmed to perfection and served in a hearty mug. Mexican Hot Chocolate -- A heavenly mix of masa, hot chocolate, Milagrio Reposado Tequila, Milletti Amaro and Ancho Reyes (chile liqueur). Topped with tortilla whipped cream and a sprinkle of ancho chile pepper and salt. Cantina 1910 is now open for brunch on weekends from 8am-3pm, and re-opens for dinner at 5pm. The bar remains open until the wee hours of the morning for drinks and desserts.